One of my former student's thesis completed in 2002 is now available digitally from the Lincoln University library. Shelly Morgan completed her research on cats in a semi-urban environment over a decade ago (the work is titled Movements and hunting activity of house cats (Felis catus) living around Travis Wetland, Christchurch, New Zealand). Normally I wouldn't draw attention to this kind of thing but cats and the environment are big news in New Zealand at the moment. There are lots of opinions about cats but very little good information. Elements of this thesis were later published in Wildlife Research in 2009. Basically, we wanted to see what cats do when living at high densities at the edge of a semi-natural reserve. 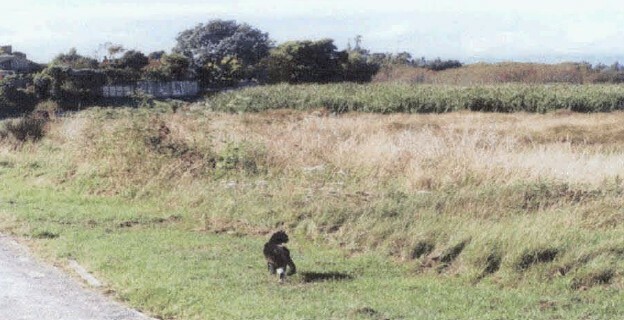 Shelly spent a lot of time knocking on doors in the vicinity of Travis Wetland, a wetland within the boundaries of Christchurch. At the time (before building boom and then earthquakes) there were about 200 ha of housing and we estimated that there were about 500 domestic cats in this area. Shelly got a lot of basic information about cat ownership, what prey cats brought home as well as putting radio collars on 21 family moggies and seeing where they went. Half of the tracked cats entered the wetland, moving in as far as 200m. In terms of prey, over 2/3 of prey were introduced species (mostly rodents). Native lizards and insects were also common. 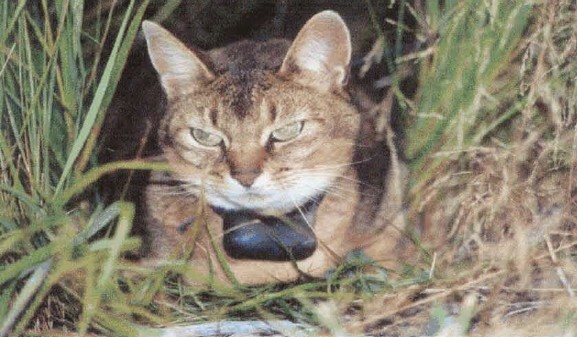 Shelly states: " The number and type of prey retrieved was not significantly influenced by whether a cat was wearing a collar with a bell, cat gender, cat breed nor the number of times a cat was fed a day. Hunting activity was significantly affected by the age a cat was desexed, cat age and type of food fed to the cat. Cats that lived closer, travelled further and spent more time in the wetland were found to retrieve a greater diversity and number of prey, suggesting that the proximity of natural habitat had a significant influence on the hunting behaviour of these cats. Home range sizes of the radio tracked cats (12 male, 9 female, all desexed) varied from 0.1ha-10.1ha. The maximum distance the cats moved from their homes varied from 29m- 276m." So should cats be excluded from such areas? Well like everything in science this depends... Yes the cats in Travis were impacting heavily on lizards but the most common prey items were rodents. By removing rodents, which themselves impact on native species in the area, cats do provide an ecosystem service that is hard to replicate without costly control programmes. If cats a removed from an area and rodent numbers build up, then they will impact on local biodiversity in a similar, or worse, way to the cats. If owners kept their cats in during the day, when native lizards and birds are mainly active, and let them out at night, when rodents are mostly active, this would further enhance the positive ecosystem service that they display. Simply removing cats from an area will increase the densities of rodents as we are seeing in the abandoned parts of east Christchurch. A further study that looked at cats on the boundary of Orton Bradley Park on Banks Peninsula by Cara Hansen (Movements and predation activity of feral and domestic cats (Felis catus) on Banks Peninsula) found similar kinds of results. So cats are both a positive (removing pests) and negative (removing natives) impact on the local environment. Accepting the 'good and bad' aspects of cat behaviour is an important step in deciding how to progress to the best solution for everyone. After 80 questions in 8 rounds that ranged from whether the UK had more sheep than NZ (they do!) 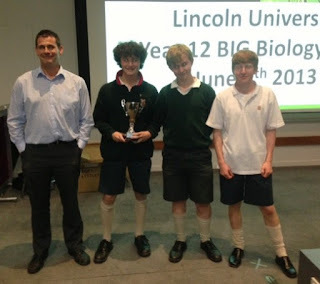 to what you would be doing if you were indulging in entomophagy (eating insects) we have now found a champion team in the 2013 Big Biology Quiz. Twenty two teams from the Christchurch region competed to see who was king of biology trivia at year 12. This year was probably the closest fought yet, with six teams right in the hunt going into the last round. Coming out on top was Team Point Five from Lincoln High School (63 points) who pipped Hydrophobic Whales from Riccarton High School (60 points) after the defending champions had led all the way. Coming in third, to make it a great night for Lincoln High School, was Team One (59 points). Well done to all of the teams. The winning team from Lincoln High School: Dacre, Lucian and Taylor with their teacher Mr Kent.